The Hughes Music Show is back for the start of the 2019 season! This show has a cast that consists of the world’s largest performing family. 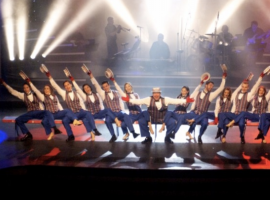 This family astonishes audiences each show with spine-tingling harmonies, soaring powerful vocals, virtuoso instrumental performances, infectious comedy, and intoxicating multi-layered musical arrangements of the best in pop, rock, R&B, country, classical, Broadway, patriotic, and gospel music. The Hughes Music Show features the Hughes Brothers, their wives, children, and an award-winning live band. Audience members will love all of the colorful outfits, vibrant lighting, incredible production numbers, captivating original choreography and state-of-the-art sound. The Hughes Music Show is guaranteed to put a smile on everyone’s face. Don’t miss this incredible show while you’re in Branson. Call 877-368-3782 for tickets!